This summer, Sami Apps incorporates new stories into the digital library. Four titles of Kerle the children’s label of the German publisher Herder. These apps are part of the project Digital Library of Sami Apps. Within the Digital Library we find educational apps based on Fairy tales and Bedtime stories from different publishers. The app of each title includes the adaptation of the book in this new format, with a lively reading and interactive activities complementary for children. We adapt the Reading for children so that they acquire the reading habit and develop the under-standing of these kids stories included in the Digital Library of Sami Apps. Antonia & Ole – first day in school is a lovely story working on hopes, fears, doubts entering school. Antonia & Ole soon will go to school, so they visit their school some days before and discover a lot of interesting things and have fun. The app also adds preschool activities like knowing and writing letters, numbers and quantities. Fritzi, a young goat, is different than the other goats: she never fears nothing. So one day she starts traveling to see the world and learn what is fear. What will happen in her journey? This is a encouraging app for kids to treat fear. Fitzs lives with his family of easter bunnies. But Fitz is different, he does not follow the old school work of easter bunnies. He is much better in other things. There will be a time when Fitz will prove his value. Find out browsing the pages of these night night stories, looking at its pictures, enjoying its animations and hear native speakers in 7 languages (English, Spanish, Catalan, Portuguese, French, German, Italian). Your kids will love to add these apps to their bedtime stories. But this doesn´t end here! Besides the fairy tale, these apps has interactive activities to keep playing and learning. What will you find in our apps? Parents may read these bed time stories to your kids or enjoy together narrating of fairy tale. These apps are produced and created entirely by Sami Apps. With this project created by Sami Apps (Award winning of El Chupete 2015 the best children’s application, of the Academic’s Choice Awards 2016, and the The best Mobile App Awards 2016), we grow our family of educational applications. A new project born from the collaboration of Sami Apps with children’s publishers, and with the support of the General Directorate of the Linguistic Policy and the Secretariat d’Afers Exteriors of the Government of Catalonia. Tinycards for Kids: learn up languages with our flashcards and activities! Tinycards for Kids: learn up languages with our flashcards and activities! Every word has a video to totally understand and enjoy! Your children will love it! Time to learn and have some fun! Learn up to 7 languages with our flashcards and activities! Every word has a video to totally understand and enjoy! Your children will love it! Get the lovely illustrated flashcards / tiny cards (Transports) in 6 languages. The parenting app to learn the first words together with your toddler, every word supported with video. The flash cards / tiny cards are available in 7 languages and support many kids games / activities to improve your toddler’s first words / language skills. PreSchool App that steps in after your baby has left the wonder weeks. Educating a baby Einstein with our flashcards is possible. Duolingo for toddlers. The complete learning language app. The proven way to learn a new language (native or foreign) for toddlers, kids or even parents! Don’t hesitate! Download the only complete PreSchool Flashcards / Tiny Cards App Transports with kids games on the market. At Sami Apps we are fans of Christmas, because although it is cold it is time to be in family and have fun. The true protagonists of the magic and the illusion of these holidays are the children, without them there would be no Christmas. For Sami Apps the smallest ones are also the most important and our reason for being. At Kids Safe Video Player we celebrate that Christmas arrived with the best videos of Christmas theme. During these holidays, the little ones will be able to continue to find videos to learn the basic concepts and vocabulary, chapters of their favorite series, the best known songs, and the most entertaining cooking manuals and recipes. But these days all these videos will have a Christmas touch to continue enjoying these holidays. In addition, we release language within the application! This is available in Spanish, Catalan, English, German, Portuguese, and now you will also find Arabic. Oh! If you have any more proposals of Christmas videos do not hesitate to send it to us through our mail blog@samiapps.com. **Awards** From the award winning Sami Apps team (Academics Choice Smart Media 2016, 1st place in the International Children’s Communication Festival El Chupete, 2015 and Appszoom, best family and games apps of 2014). We present our Smart Baby Sensory Stimulation app. For that very reason, Sami Apps presents the next milestone app for your baby: Smart baby sensory stimulation. The most complete app to develop & stimulate baby senses for a baby wonder including white noise baby. The first app that includes audiovisual stimulation as a fundemental activity for babies and toddlers between 6 and 24 months to educate Smart babies. Our Sleep Baby owl white noise app helps your baby to relax, stop crying and sleep better thanks to our quality baby sleep sounds such as the ultrasound of the womb or the vacuum cleaner. The most popular feature of our baby sleep app is the record your own voice function. Sing your baby’s favorite baby lullaby and it will get to sleep in no time. All tested and requested from you as parents. The only app that includes all main areas of baby development in one single app to make a wonder baby happen. Smart Babies are carefully educated with the right baby development activities. Don’t hesitate! Download the only complete baby stimulation app on the market: Smart Baby Sensory Stimulation. From the award winning Sami Apps team (1st place in the International Children’s Communication Festival El Chupete, 2015 and Appszoom, best family and games apps of 2014), we present the Sami Apps Kids Videos & Cartoons Player. Now also available in your Android powered Smart TV! The perfect solution for kids and parents to watch Internet videos in a safe way. Our Parental Control will ensure that your kids can not upload videos on their own, and that no ads are shown while the kids are watching their videos. The only kids video app where parents can add their own YouTube videos with parental control. Every week, we add new YouTube kids cartoons in six languages: (English, German Spanish, Catalan, Portuguese, Arabic). Our team selects the best YouTube videos for your kids. These include kids’ favourite cartoons from the official YouTube channels. We include baby rhymes and nursery rhymes videos for little babys, but also animation videos and DIY videos for kids between 2 and 5 years. There are 50 new videos every week in every language. You’d be surprised what fantastic kids videos we have discovered in YouTube. – Every week, we add new content: our kids experts select the best YouTube videos for your kids in categories such as: learn, cartoons for kids, sing nursery rhymes and DIY or play kids videos. – Languages: watch videos in English, German, Spanish, Catalan, Portuguese and Arabic. – Add videos: only parents (apart from Sami Apps playlist) can add new YouTube Kids videos, so you can always control the content that your children are watching. – Timer: Limit the time that your kids spend watching their favorite kids cartoons. – Different sections that classify these videos by theme: This will include educational, fun and music videos so your child can learn, play, dance and laugh. The integrated Parental Control protects your small kids from unexpected video surprises. You will know that at all times, your kid will be watching safe content appropiate to his/her age. The SamiApps kids Video Player allows the smallest at home to have fun freely. You can enjoy YouTube Kids videos in a totally safe way for your little ones! Our work is guaranteed by quality seals and our expertise is in developing educational apps for children, where parents can also find educational pedagogical Information with explanations, suggestions and tips for working with your children at home. Disclaimer: We are using YouTube technology (Youtube API) to connect to YouTube and show you the videos. We are not part of “YouTube” or “YouTube Kids” and we can’t control the advertising shown in those videos. In using our app, you agree to the YouTube Terms & Conditions (http://m.youtube.com/terms). Don’t hesitate! Download the Must-Have Kids Video Player of the market! Visit our Video Channel, Sami Apps with weekly new videos to learn and grow with small kids! Specially designed for international families! Flashcards for Toddlers and small kids in many languages. Now also in Portuguese and soon in Arabic. Sami Apps has released four new applications getting bigger our family of apps. All of them are aimed at parents with preschoolers who seek to continue working or reinforce at home the first concepts learned in school. And at the same time improve the education of your child. You can download our new apps! An app designed for babies 6 to 18 months. With it, the little ones can work the first movements with his fingers and coordination. They also learn to identify the sounds of different animals and transport, which will be played over the screens as it changes its character and level. Available for iOS devices in the App Store and Android in Google Play. 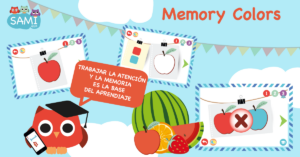 A perfect app for working visual memory of children through pictures of food, animals and transport assisting in the development of the smallest. It also helps improve attention, concentration and increase retention and analysis of any information. This app has different levels at which children are shown a model to observe. Then it offered the same picture but with blank areas for them to color on the model they have observed. When you have already filled in all the blanks, they appear the two images together to compare them (the app itself tells you whether it’s right or not). It also has a section free drawing designs just coloring. Draw lines is the first step in the process of learning to write. Practical guidance, the work of the hands and twist of the wrist to draw lines in different directions will ensure the future success by writing letters. With this app the little ones can practice on different directions and silhouettes that arise and enjoy all levels. Perfect for learning numbers. Children do not learn the numbers say when or identified, but they are able to establish a relationship with the object. For example, when they know the number 5 corresponds to the amount of five objects. 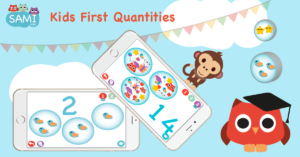 Therefore, with this app children begin to understand and learn the real numbers and to relate each spelling the series with the number of objects belonging. 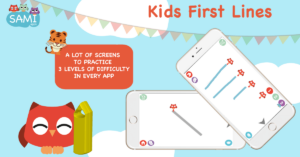 The Baby Coordination users who have mastered the first two levels, can now move to the third level of difficulty. The Sami Apps’ applying is designed for babies 6 to 18 months. The babies will refine their motor skills and coordination of their fingers and hands. At the same time, they improve their senses to identify visually and by ear the different animals and types of transport which appear in the application. 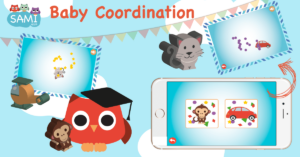 Baby Coordination is the first contact for your children with the mobile and digital world! This app is available for iOS devices on the App Store and Android in Google Play.